Hit as Many Homers as You Can! I currently own the only know copy of the "One Million Point Home Run" version of the PowerFest ‘94 Competition Cartridge for the Super Nintendo (SNES). JJ owns the only known copy of the "Ten Thousand Point Home Run" version. 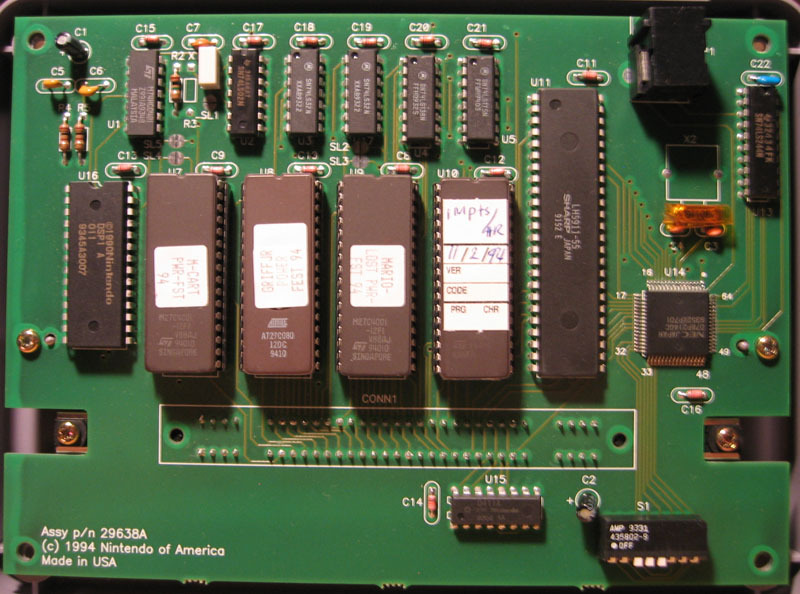 Aside from those two carts known to have survived the rest were disassembled and used for parts by Nintendo of America. I bought the game from the lucky guy (Left on Photo) who got it at a garage sale from someone that used to work for Nintendo. We met in person to exchange the money for the game at Ananda Ashram because that location was between where we each lived. It was about a two hour drive from my home. When JJ was going to buy the PowerFest '94 10,000 point cartridge I found out the transaction would be taking place only two hours from where I live. My girlfriend and I drove there to witness the transaction and I verified that his PowerFest '94 cart was the real deal and not a fake. I feel so lucky to have lived so close to both people that had the PowerFest '94 carts that I was able to do my transaction in person and be a witness for JJ's transaction. 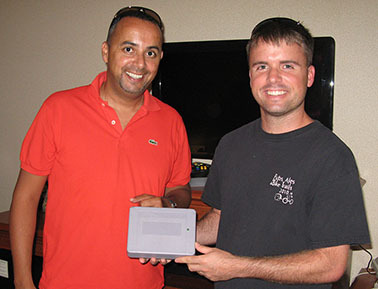 Me (right) finally receiving the 1,000,000 point version PowerFest '94 cartridge after a long 12 year search! Photo taken at Ananda Ashram in Monroe, NY on December 2nd, 2006. 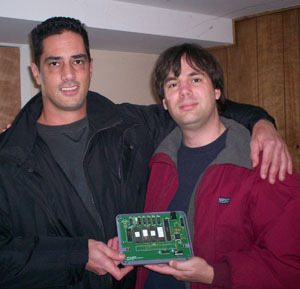 JJ (right) finally reciving the 10,000 point version PowerFest '94 after 74 emails, 27 months, 6 phone calls and 5 failed meeting attempts. Photo taken at the Holiday Inn in Rutland, VT on July 14th, 2012. Here are what other rare compeition carts have sold for in the past. This won't be cheap as it is a one of a kind item. 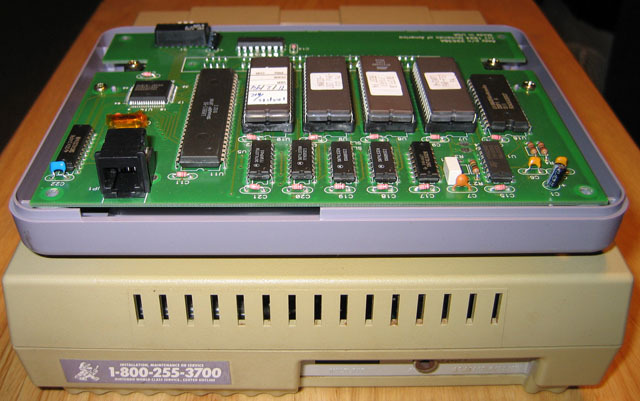 It is even more of a Holly Grail for collectors then the rare Gold Cart for the PowerFest '90. The PowerFest '94 one million point version is in fact 20 times as rare. The PowerFest ’94 game is much bigger then the average SNES game. It has a cord that goes out the back so it can network with up to 8 other games and it displays everyone’s score on a separate monitor and is set up with a timer that stops all the games after 6 min. 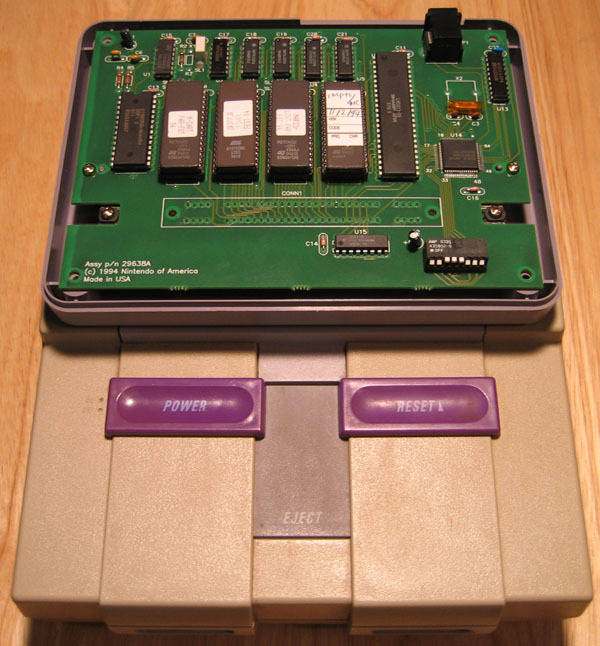 It is the same design that the Nintendo 1992 Challenge cart uses. 3. 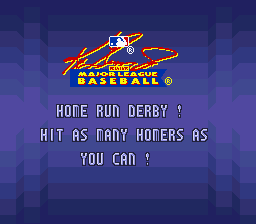 Finally, Ken Griffey Jr. Home run derby where all the real points come from by hitting home runs. 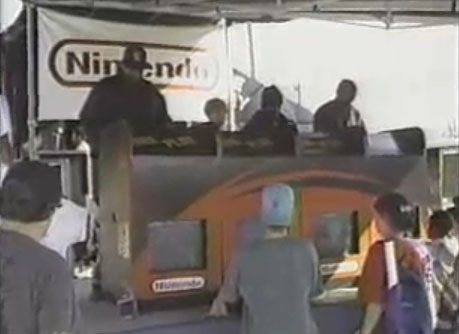 The name of this event was the PowerFest '94 also known as the Nintendo World Championships 2. I participated in this competition in Albany, NY and I won a $3000 trip to San Diego, CA to play in the world Championships. They did not even give the winner a copy of the game. I heard the reason that all the winners did not get one was because they only made 32 copies and did not have enough to give out to the 132 people that won the trip. I was on the winning team (The Tornados) but all they gave out for that was a special Donkey Kong Country t-shirt. Mike Iarossi and Brandon Veach. Mike Iarossi was the grand prize winner of the PowerFest ’94. 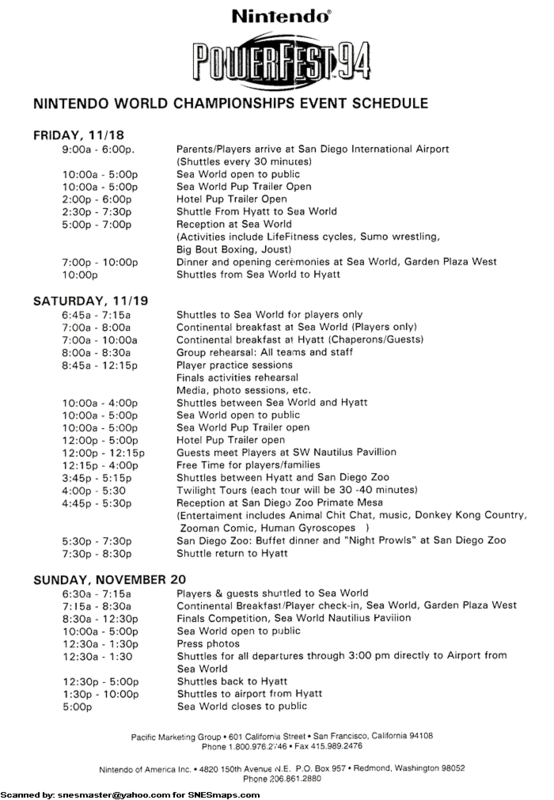 View a Schedule of the PowerFest '94 Events that took place at the finals in San Diego, CA. 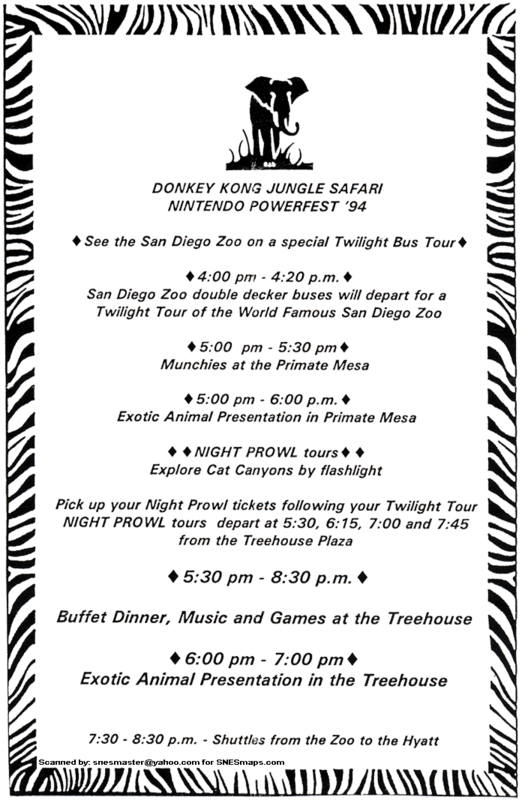 View the Donkey Kong Jungle Safari Nintendo PowerFest '94 Schedule for Saturday Evening (November 19th, 1994) at the Finals. There are 8 switches that can be either on or off. The game time used for the competition is shown with a blue background (6 Minuets). The Test Mode is shown in a purple background. I first heard about the PowerFest ’94 in early 1994 through talking to people at Nintendo and asking if they were going to do another competition in 1994 like they did for Star Fox in 1993. For a while they had some of the same people that answered the phones for customer service play and test the PowerFest ’94 game. I would call into customer service and ask as many questions as I could to figure out what games were in the competition cart and what part of the game would be in there. Then I worked on finding out what the objective was for that game. 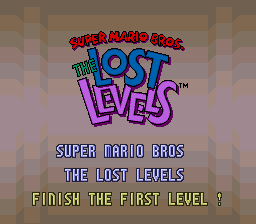 I figured out you had the complete the first level in Super Mario Lost Levels from Super Mario All Stars. 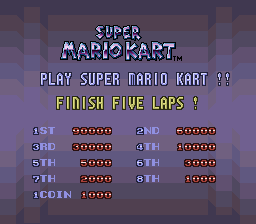 Then I knew you had to play Super Mario Kart next. However the person I was talking to did not know much about that game so he did not know the name of the level they used in the competition cart. I asked him if there was a bridge at one point in the level and he said yes. Along with other information I figure it was the 2nd level in the game. However I later discovered that was incorrect when I went to the actual competition and found out it was the first level. That made me wonder where he imagined the bridge from since there is no bridge in the first level. However that did not cause me too many problems since when I practiced I needed to play thought the first level in order to make it to the second level. The third game was Ken Griffey Jr. Home Run Derby, where you had to hit as many homers as possible before the time ran out. I owned the first two games and I barrowed a copy of Ken Griffey to practice with. I used my VCR to record myself playing and would go back and watch to figure out ways I could improve how quickly I made it through the first two games. At this point in my life I was 20 years old and going to college at SUNY Morrisville for Computer Science. I had an interview with Jamesway (a local department store) for a summer job. When I went to the interview I told them I had to have a certain weekend off when they were doing the PowerFest '94. I went to the competition with a friend of mine from High School. Chris and I set out early Friday morning to go to Albany, NY from North Norwich. It was about a two and a half hour drive. However it took us a bit longer then that. According to the map the route we wanted to take started in Norwich and only went one direction. However that was not where that road started and it turns out it went both directions and we did not discover that until around 40 minutes later. Then we turned around and headed back to Norwich and went the right direction that time. As we got close to Albany we stopped at a rest area and I used a phone to call Jamesway and found out I had gotten the job. After all that we still made it to the Wall*Mart in Albany as they were setting up the competition. The guy running the competition was named Tony. We got there a little before they started the competition, so we looked around at the various SNES games they had set up for people to play. They had multiple games hooked up to a single SNES and you could select witch to play. When it was time to start the competition Chris and I were the first to go up and play. We were the only people playing at first even though they had it set up so four people could play at a time. Tony said he was impressed with my score, saying he never saw someone get a score so high the first time they played. I won a t-shirt and then Chris and I played again. It was not until around third or fourth time playing that several other people started to show up. It turns out Nintendo was leaving it all up to the stores to advertise for the competition. Apparently all Wall*Mart did for advertising was in the newspaper. This weekend was also the Grand Opening of this Wall*Mart. So not too many people knew about the competition. By the end of the day more people were showing up and we had to wait in line to play, but not more then one or two rounds of game play. Chris won a t-shirt on the third or fourth round. After the competition ended for the night Chris and I wondered around in the Wall*Mart. We did not have the money for a motel, so we slept in my car. At the time I drove a 1986 Honda Accord. On our way back to the car we saw Tony and some of the people he worked with hanging out and eating pizza. We thought about going over and hanging out with them and asking for some pizza, but we decided against it. I don't have any photos from the event I attended. The next day we got there as Tony was setting up. We got to see what the competition cart looked like when it was hooked up to the SNES. Normally it was in a cabinet so you could not see it. Tony let us play a few rounds to test it out and make sure it worked good before it was time to start officially. He told us our scores would not count for that time but it would let us get some practice in. We also mentioned to Tony that we saw him and his friends eating pizza the night before and that we were tempted to come over and ask for some. He said we should have come over and that he would have given us some pizza. Then he said that he would take us out for pizza that night. As the day progressed more and more people started showing up. Word was getting around. The main people of note were one kid from Canada who came with with his father. There were also two brothers from around New York City that were known as the Getty Brothers. For a while the top score slot was switching between Chris, myself and them. At one point mid Saturday morning I got tired of standing up all the time. Chris and I went in Wall*Mart. I bought a folding chair and Chris bought a stool. That way we could sit down while waiting in line. Tony even let us sit down in them while playing in the competition. It was not long after that that several other players also bought chairs to sit on. By mid afternoon it got to be over an hour wait in-between plays. It was a nice sunny day and it was starting to get a little hot out there. At one point someone from the Albany Newspaper came by and took a few pictures and asked some questions. At that time I held the high score, so he came over and talked to me. I told him how Chris and I had heard about the competition and how we were sleeping in the car. That evening after the competition was over for the day Tony drove us over to the Crossgates Mall and treated us out to pizza at Uno’s. He put the meal on his company card. It was fun chatting with him and nice to get a free meal. After dinner he dropped us back off at the Wall*Mart parking lot. Then Chris and I went to bed. At some point I woke up and I saw lots of light. At first I thought it was the sun and that it was morning. However as I came a little more to my senses I realized it was a cop car shining its lights into my car. The officer came over and knocked on my window. I rolled it down and he asked me what I was doing. I said sleeping. Then he asked why we were sleeping there. I told him about the Nintendo competition and he told us that an alarm went off at a near by store and they were checking it out. After that the cop left and let us get back to sleep. All four of us got up on stage and played. It was intense and my heart was beating like a rabbit, I knew all I had to do was make it through two more rounds to win the grand prize (A trip to San Diego, CA to play in the finals). When the time ran out I looked over at the other peoples screens to see if I made it. I could not believe my eyes, not only did I make it but my friend made it as well. I then knew at least one of us would win the grand prize! After 3 days of intense gaming it has all come down to this final round between me and the friend I came with. I was more relaxed now that I knew one of us would walk away the winner. The game started up and Chris and I quickly made it through the first two games. Once Ken Griffey Home Run Derby started I would check his screen every time my ball was flying through the air to see how he was doing. We were going neck and neck, sometimes he was in the lead and others I was in the lead for the most home runs. I was only one home run ahead of him and he was just about to beat me with a homerun he hit and just half a second before it was about to land and register the score the time ran out and I won. You can't get much closer then that! I had won the trip to the finals!!! A 2nd PowerFest '94 Cart Has Been Found! 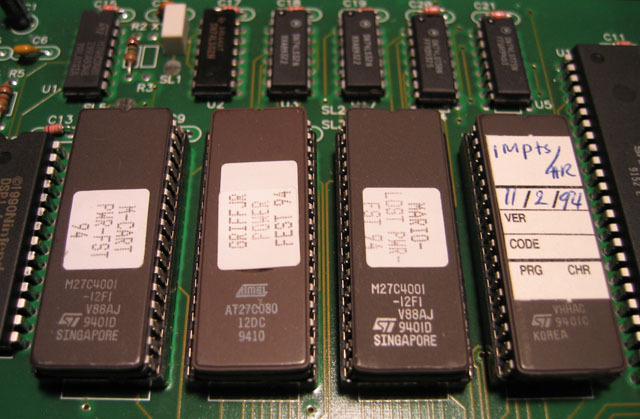 The 1st screen was used in the local competitions across the country. 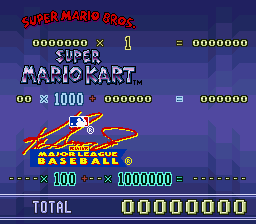 The score for each home run in that version was 10,000 points. 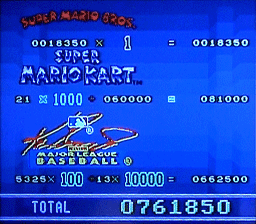 The 2nd screen was used in the finals in San Diego, CA where they changed the score for each home run to 1,000,000 points. Aside from that one difference the game is exactly the same. The board is the same for both versions of the game, with the only difference being the Menu Chip that shows the title screen as well as the score screens. 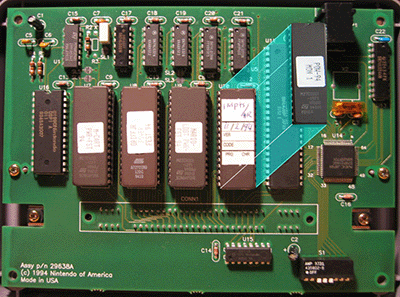 PowerFest '94 cartridge to JJ.